To many people, January 12th may just be another day on the calendar; not so for me. 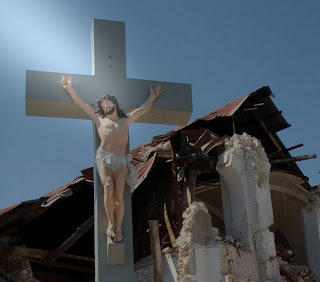 It is the third anniversary of the devastating earthquake in Haiti, one which managed to kill more than 200,000 people. I happened to be there on that fateful day, as I had been sent to Haiti as a Jesuit novice just a week before. As Providence would have it, I was able to help out with the rescue effort at ground zero, as well as to learn about the Haitian culture during my five-month stay. Some only know of Haiti in photos and video footage after the earthquake, which were mostly depictions of destruction, chaos and rubble. Some may not even know about it at all. In that sense, my arrival the week prior was priceless in many ways, as it gave me the opportunity to know a bit about the country before the disaster struck. I would use a Chinese phrase to describe both the pre- and post-earthquake state of Haiti: qian chuang bai kong (thousands of sores, hundreds of holes). The earthquake undoubtedly caused a catastrophic level of damage, but it did not create the crater-sized potholes on the road. It did not create the mountainous piles of garbage that one found on the street corners. It did not create racism or discrimination; nor did it create poverty, injustice, or corruption. If anything, it exacerbated an already desperate situation. I would venture to say that nothing much has changed since I returned to Canada at the end of May in 2010. Obviously, the goal in rebuilding Haiti is not to return to the status quo, as that would be too low of a baseline. There needs to be a systematic overhaul. The key question remains: would you like your country to be governed by a conglomerate of non-governmental organizations (NGOs) from abroad, or a non-functional government? No matter how one spins it, Haiti seems like a sad story that continues to write itself towards a similar ending. The sense of helplessness permeates so many aspects of life in the western half of Hispaniola Island. This is a feeling that I have come to know quite well. It was the feeling that surfaced after eight straight days of exhausting work with doctors and medics, as I realized that thousands of the perished ones had become an afterthought under the rubble, despite the lives saved through our efforts. It was the feeling that arose within me when an old lady was forced to leave the hospital to return “home” one day after her orthopedic surgery. It was witnessing the horrendous conditions of the refugee camps, especially after a night of major downpour. It was when I heard from one of my students, that the only reason she took my English class was to distract herself from thoughts about her son who perished in the earthquake. Surely, the work in Haiti was not for naught; it's just that it is so difficult to see the positive changes happening on even a medium scale, and it is truly dispiriting. This is not to dismiss the small but beneficial changes that have been made, but to come to terms with the reality that not many of us are called to be a Paul Farmer, who has made ground-breaking efforts in providing health care to the poor. And even he once said in his biography that his work in Haiti was like “fighting the long defeat”. Even if we focus on the positives, we inevitably need to recognize that we are overwhelmed by the negatives. How are we to deal with these seemingly futile efforts? This is akin to what we Jesuits call a “Third Week experience”, which is referring to the dynamics of the Spiritual Exercises by St. Ignatius of Loyola. On the Third Week, we are invited – through the active use of imagination in our contemplation – to be with Jesus during his Passion. We see him being arrested, insulted, humiliated, flagellated, beaten and broken in every aspects; yet we cannot change a thing. Even if we are like Simon of Cyrene, who was able to help Jesus with the load of the Cross for a short while, it does not change the fact that our Lord is despised and rejected of men. He is still going to be crucified. Again, seemingly futile efforts. The key of the Third Week, however, is being with the suffering Jesus. When we are in solidarity with the suffering, this act is meritorious and fruitful in itself because we are with Christ, even if it seemingly does not change the doomed outcome. To be with the suffering is to love, and love does not always taste like honey or smells like roses. Yet, this is what the Lord commands of us, and by doing so, he promises that we shall get a good glimpse of who we are truly meant to be. Union with God is what we ultimately desire as people of Christian faith, and let us not make this too abstract or distant. It can happen right here, right now, in a willingness to be with the suffering Christ, or the abandoned and neglected Christ (Matthew 25: 31-46). In this sense, the Lord invites us to come be with him in his suffering through the real, palpable suffering of our brothers and sisters. The desire to strive for justice and peace should always be encouraged, but this should not take away the value of being with the suffering; for it is Christ looking into our eyes, and extending his hand to invite us to journey with him to Calvary. I get the same feeling of hopelessness and helplessness when I reflect upon Haiti, which, whenever I do it, always leaves me with a sad and empty feeling. So brother Lo, here is the question: what are the long, slow defeats that we need to fight every day in our lives in Canada? Helpful to see it so obviously in an example such as Haiti, harder to see where we must rally in battle in a fight that seems already lost in our North American lives. I think this is why the vocation to the priesthood, to any authentic attempt at christian life, can sometimes seem utter nonsense in the American imagination. I think it's where Tolkien retains such a powerful hold over our imaginations...what are the battles that need to be fought by a bunch of Hobbits? Where is hope found in that?...it relates back to the Christmas mystery in my mind. You are right: it is more difficult to see long, slow defeats on a large scale in affluent countries such as Canada; there are many frustrating things happening in our society, but they don't often trigger a sense of hopelessness. I would imagine that these moments do exist, but they are more apparent in our personal lives. For instance, accompanying a friend who is mentally ill can feel like a constant losing battle. Being with a loved one who is dying is another. Ultimately, it comes down to the question of whether there is meaning behind all these losing battles; and through our faith, it seems that we have to say "yes". Walking with Jesus to Calvary does mean something.